Cousins William and Gary Dunlop share a joke at the Classic TT Races in 2017. The Ballymoney-based Joey’s Bar Racing team says the world is a ‘sadder place’ following the tragic death of William Dunlop this year. The 32-year-old lost his life in a crash during practice at the Skerries 100 in July. Gary Dunlop on the Joey's Bar Racing Honda during practice at the Armoy Road Races. On Wednesday, a statement issued by the Joey’s Bar team, which runs Moto3 and 125 Honda machinery painted in the iconic livery of 26-time Isle of Man TT great Joey Dunlop, said they had ‘lost a friend and loved one’. It read: “Sadly, the season was tainted for everyone with the untimely death of our friend and loved one, William Dunlop. Mullingar man Derek McGee and Gary Dunlop competed for the team in 2018, enjoying plenty of success on the domestic road racing scene. Mullingar man Derek McGee on the Joey's Bar Honda Moto3 machine. The team statement added: “2018 has been an incredible season for the team with a lot of success but also some very difficult weekends. The goal at the start of the road race season was to try and win a few races but have fun doing it. 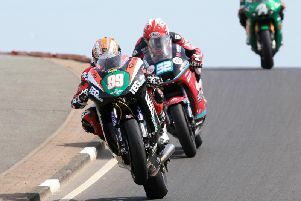 “We gave Derek McGee the best bike we could to achieve this goal and boy he didn’t disappoint. Not to be outdone, Gary grabbed the Joey’s Bar Racing/MCC 125cc to compete in selected races and boy, he didn’t disappoint either. The statement continued: “The top three steps of the podium were frequented often with Derek and Gary swapping the steps with each other. We ended the season on a high.